There seems to be a direct correlation between anxiety levels and tools dropped during a climb. Our studies have also shown that, once safely off the mountain, the number of tools you drop also correlates. When literally anything but an ego falls during a climb, everybody loses. Concerned you'll drop a leashless tool while climbing with cold hands? Not anymore. 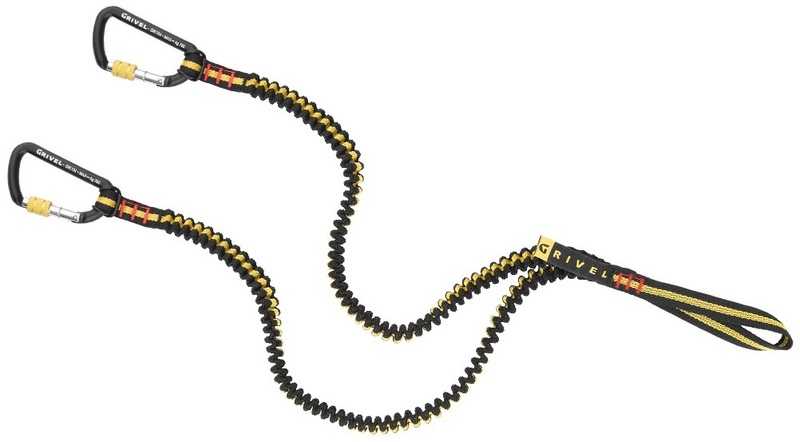 The Grivel Double Spring leash attaches to your harness via girth hitch and each tool via small locking carabiner. The springy elasticity ensures that the leashes are out of the way when you want them to be, but extend far enough to never impede reach. Tethers are the bomb for modern tools. Vanity or severely difficult modern mixed routes are the only reasons to not use them. I've had the BD version ever since I went leashless years ago. But the wire gate on those have their drawbacks. As usual, Grivel does it better with the lightweight locking biners.